I had made a mediocre start to the tournament, but in round six I had won a nice game and had finally achieved a plus score. Before this game I had never beaten anyone rated above 2150, and after this game I still hadn’t. Faced with the challenge of a much higher rated player I produced one of my worst games of the tournament. 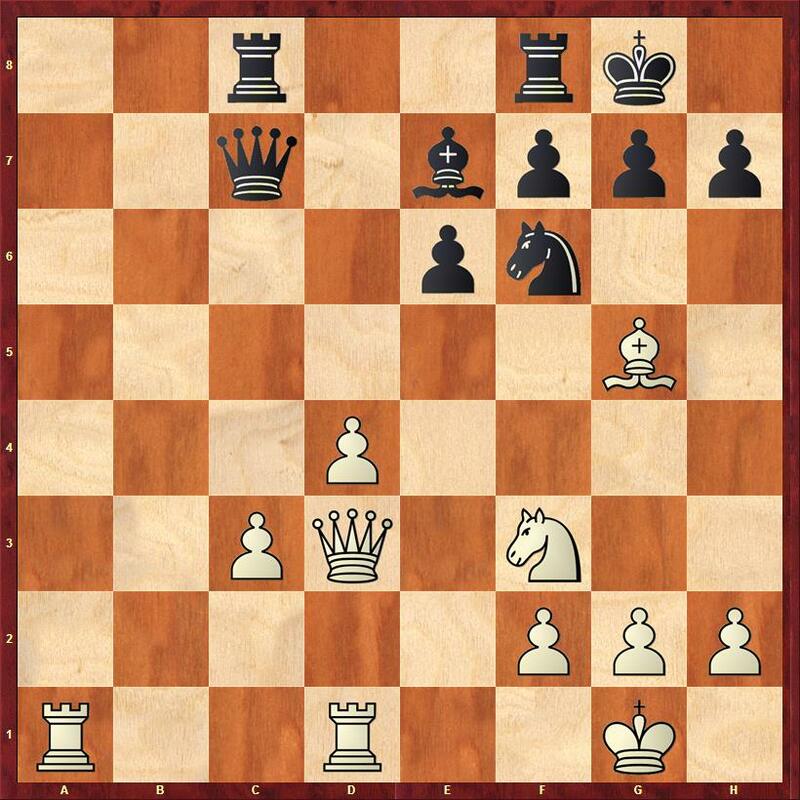 We join the action after 13 moves of a game that began as a Semi-Slav defence, but has reached a position that very strongly resembles a Stonewall Dutch. 18…Bc4? My opponent thought for quite a long time here – his only significant think of the game and made a mistake. 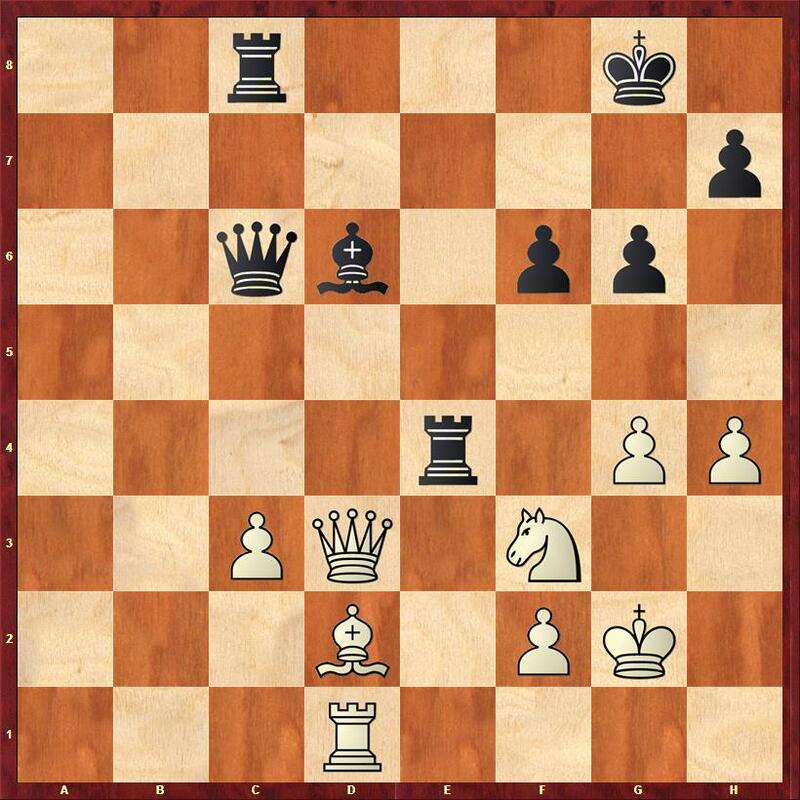 The error I had made when making my 17th move was in the variation 18… Bxg2 19. Nfg6+ hxg6 20. Nxg6+ Kh7 21. Nxe7 Qd7 here I had miscounted the number of pieces on the board assuming I was going to be level rather than a piece down. The game continued 19. Nfg6+ hxg6 20. Nxg6+ Kh7 21. Nxe7 Qe6. I assumed I was lost at this point, so I went for what I thought was the most active move 22. Qd1?, but I could have played 22. Qc3 with the point of picking up the a pawn after 22…Qxe7 23. b3 Be2 24. Qd2 Ba6 25. Qxa5. 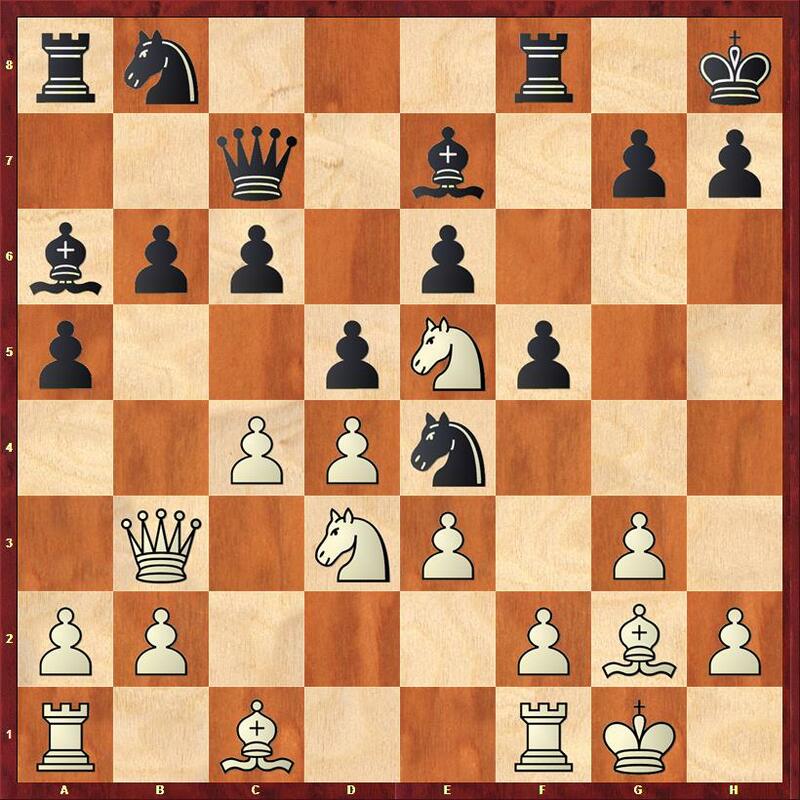 In the resulting position I’d rather be black, but white does have three pawns for the piece and the bishop pair. 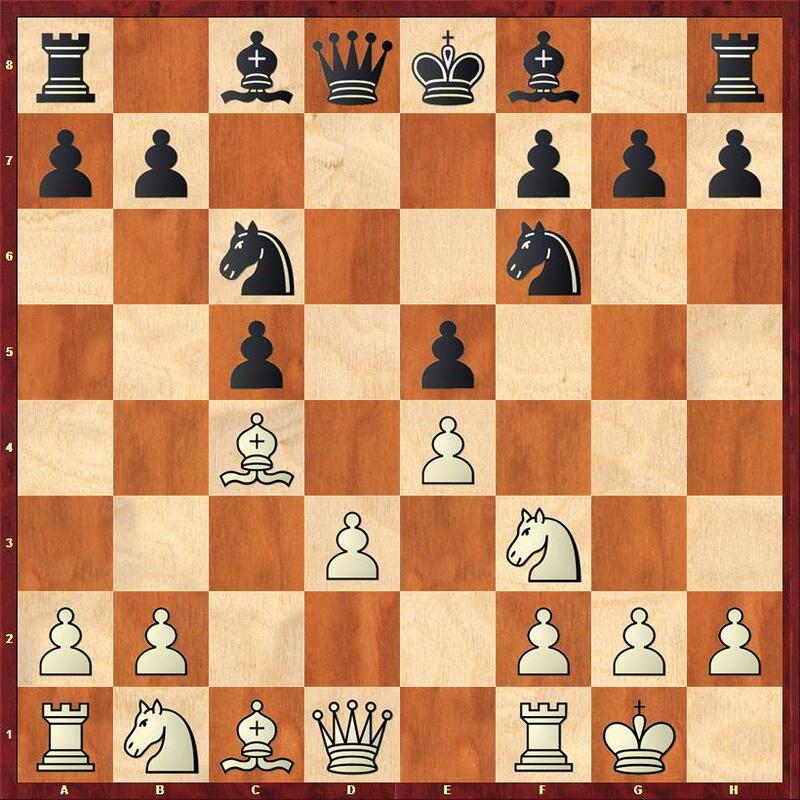 Instead I sacrificed a pawn to open lines on the kingside and generate some pseudo-activity. My opponent swiftly neutralised this and checkmated me after 13 further moves. At 50% after seven rounds I needed a big finish for an acceptable result. After 20 moves of my round 8 game it wasn’t looking good. I am threatening Rxg4, so white defended with his king 44. Kh3 unfortunately it turns out that this doesn’t defend the g pawn because after 44…Rxg4! 45.Kxg4 Qd7+ leads to checkmate. My opponent found the best defence 45. Bh6! which gave me a fright because I had missed it – I had been expecting to win in two or three moves however the white kingside is too weak to defend and the game finished 45… Rc4 46. Qe3 Qd7+ 47. Kg2 Qg4+ 48. Kf1 Re4 49. 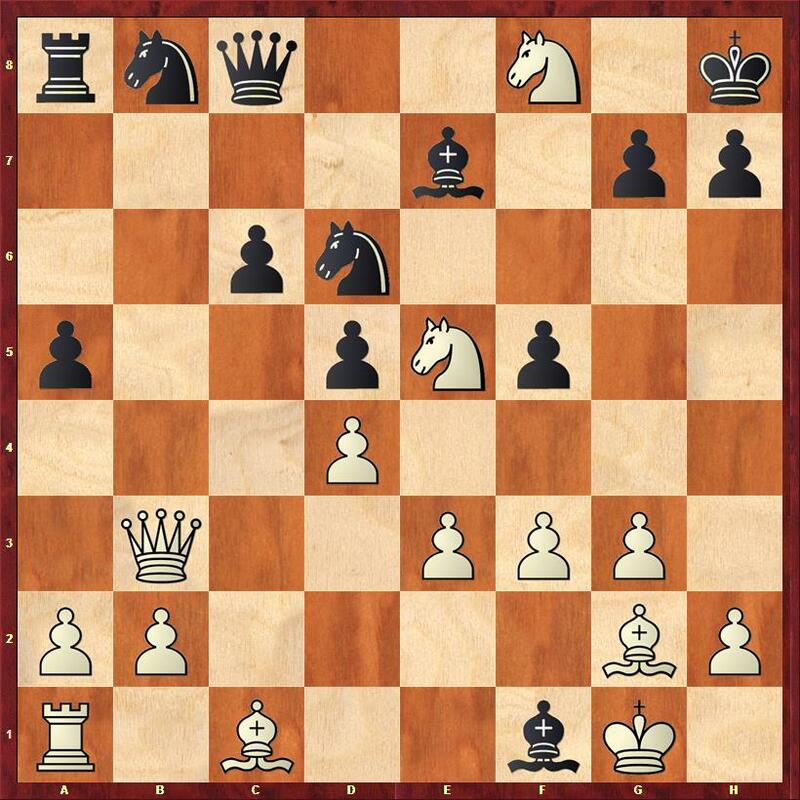 Qa7 Qh3+ and white resigned because it is checkmate next move. Here I played 7.Ng5 after which there is no good defence of the f7 pawn. Later on in the game I won a second pawn and although I did have to work a little to defend against his active pieces I was able convert fairly easily, delivering checkmate on move 29. As a resident of Aberdeen I can highly recommend Cannes as a place to visit in February. The tournament is large (there were 372 players over three tournaments) and high quality: in the B tournament there were 109 players rated between 1700 and 2000 – exactly the sort of players I want to play. If you are a higher rated player (above 2100) the A tournament is very strong with 19 Grandmasters and 23 International Masters. The venue has a pleasing view of the Harbour and the Mediterranean sea which makes an agreeable change from the various School halls and Leisure centres I am used to playing in. The negatives: on the lower boards (where I spent most of the tournament) the tables are a little bit cramped (conditions improve as you play on higher boards). Also there are two days with double rounds, where the morning round starts at 9.00 am. This can be quite tiring – in the A tournament Alan Tate lost a game against an International Master in round 5 that took over 5 hours to complete and then had to play another strong player in round 6 less than an hour later (he also lost that game). I would have taken my score of 5½/9 at the start of the tournament, however I started slowly and consequently didn’t face a particularly strong field. My tournament performance was 1867, compared to my FIDE rating of 1921 so I will have lost a few points. The feature of my play in the first part of the tournament was a failure to convert winning positions – I was objectively winning in rounds 1,2 and 5 and scored 1/3 from these games. I think part of the problem is a tendency to play passively in positions with extra material – one of my opponents described my play as too “comfortable” which is an acute observation. There is also a certain amount of luck involved – my opponents in the first two rounds defended bad positions very well where as in later rounds my opponents generally didn’t defend that well. I enjoyed my time in Cannes and I might well play this tournament again.